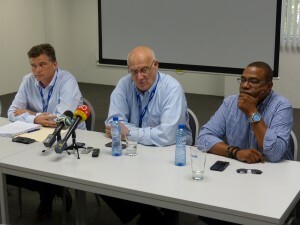 WILLEMSTAD - Since the end of January 2017, the operations and financial position of Insel Air International B.V. have been severely affected by the ongoing grounding of the aircraft by the Department of Civil Aviation of Aruba. Over that period and as part of the stabilization plan InselAir International B.V. (InselAir) was fully dedicated to its efforts in maintaining the highest level of service while ensuring the application of the highest safety standards. Furthermore, it had to constantly manage the situation with the creditors against the arrears due to them. Given all of the above, InselAir International B.V. had no option than to seek a moratorium with the bankruptcy court which was granted to InselAir International B.V. this morning. The granting of such moratorium, as a protection against bankruptcy, will allow Management to focus on the further implementation of the stabilization plan and the development of the required business plan, including the evaluation of potential strategic partnerships. This is exactly the reason for which such moratorium facility was developed in accordance with Curacao law. Bankruptcy protection may provide complete or partial relief of debts and contracts, as the business remain in operation, the stabilization plan and/or strategic partnership can be realized during a certain period. A period of moratorium of payment will offer the Management of InselAir the opportunity to actively evaluate and pursue further possibilities for both restructuring as well as the search and the negotiations with a future potential a strategic partner. Meanwhile, the stabilization plan is implemented within InselAir International B.V. The company informed the employees today of the retrenchment of 250 positions. The Management realizes the indisputable contribution and dedication of the employees involved in building InselAir up in the past decade and regrets to take the aforementioned measures. However, these steps are absolutely required for InselAir to continue in the direction it is heading and to build a new future again. The concerned authorities have been informed of the intentions of the company. As part of the stabilization plan, InselAir International B.V. has introduced the announced reduction in services and actions are being taken to secure a return to a normal schedule as soon as Management sees an opportunity. It is to be noted that Management is observing a return to a high level of on-time performance. Management reiterates its commitment to offer the travelling public a safe and improved on-time performance of its aircraft.